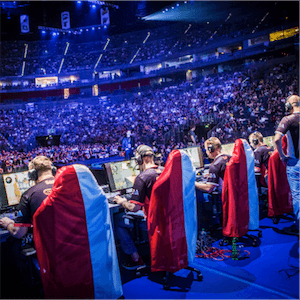 eSports or professional video gaming, is rapidly on its way to overtaking traditional sports in terms of popularity. Many major sports, like American football for instance, are actually losing viewer numbers, and don’t seem to be attracting younger audiences. eSports sees the gap and is stepping in to fill it. For the first time ever among younger people, video games and gaming have moved from the realm of nerdy, and are now being seen as cool. Professional video gaming is becoming a lot more mainstream, especially in North America and Southeast Asia. The fans watching these events fill up stadiums, while the top players earn millions of dollars every year in prize money, endorsement deals and streaming. Traditional television networks want to come on board, obviously. They see the opportunities, and they see the astonishing daily viewership numbers on streaming sites like Twitch. They want in. The market is not expected to slow down any time soon. The total revenue from betting globally is near $250bn, and eSports made up around 5.5bn of it, in 2016. Word on the street is that the gaming revenues will be as high as $13bn, in 2020. As the events get larger and sponsors become involved, this piece of the overall revenues is set to increase. Operators will come on board with better offerings, and eSports will start getting the recognition it deserves. Though traditional fans may still feel that professional gaming is not in the same league, the top video gamers have skills that match any professional field or court players. Those fans that fail to adapt nowadays run the risk of being left behind. The prize pools of some of the eSports events parallel, and in many cases supersede, the leading tennis and golf events. An example is the 2018 International Dota 2 Championship, in Vancouver, which offered over $25m in prize money. The top prize was won by the European OG team, and its five players walked away with a shared $11.2m, not including any endorsements and streaming offers. Year on year, viewership is growing, exponentially. There were about 124 million viewers in 2012. By 2017, it was up to 335 million and by 2021 it can be expected to hit 557million. There have been talks of including eSports in the Olympics, but because most of the games feature shooting or fighting the International Olympics Committee President is resistant to the idea. However, it is already included in the X Games and the Southeast Asian Games. Many major professional teams worldwide have interests in competitive video gaming, and more and more owners of leading sports teams even have stakes in certain teams. It’s clear the sector is expanding, and those who jump on board now will get to benefit from some of these amazing opportunities.